For those that were dismayed by The Scottsboro Boys’ short run on Broadway and feared it would be forgotten this awards season, all bad feelings were washed away when the Tony Award nominations were announced Tuesday morning. The musical by John Kander and Fred Ebb (the famous duo’s final collaboration together) received 12 nominations, only coming in second to The Book of Mormon, which received 14. The nominations this year were anything but predictable, serving up some serious snubs and surprises, especially in the acting categories. Let’s take a look at the 2011 Tony nominees. Although Motherf**ker was always buzzed to be a lock for this category, I’m surprised it took the spot of Bengal Tiger, which was a finalist for the Pulitzer Prize for Drama. In my predictions, I edged out Good People, but am not surprised to see it here, as I’ve heard nothing but raves from critics and audiences. I’m not surprised by my misstep with Bloody, as it was mostly a hopeful prediction. As we can see from the rest of this list, I grossly underestimated Sister Act, mostly because A) I haven’t seen it, as of this posting; B) I have not heard much about it. Most people are talking about Mormon, Catch Me, Priscilla, and the plays. I haven’t heard much word of mouth about Sister Act. I think the surprise in this category is that Catch Me made the cut. I wanted it to, and predicted so; however, many thought it was not strong enough to even get the nomination. I’m surprised Born Yesterday didn’t make the cut, due to Nina Arianda’s sumptuous performance (for which she was recognized) and the lavishness of the production. Arcadia, while worthy, slips into this category, despite receiving mixed reviews. The respect behind playwright Tom Stoppard’s name likely got it the nomination. I’m glad Miss Daisy was replaced by Earnest, as I thought it was an unimaginative production, but thought it would make it on star power alone. Earnest sneaks in for director/star Brian Bedford’s performance (for which he was recognized) and its box office success (which I still think is surprising, for this old, much-produced, play). Robin Williams’ exclusion is surprising, due to his star power, but his role isn’t large enough to merit this category, nor did that household-name factor drive Bengal Tiger’s box office. As we’ll see in some of the rest of the acting categories, some of my predictions were not eligible in the category I placed them, as I made my predictions prior to the Tony Awards Committee’s final announcement of eligibility. Falco did get nominated, but in the Featured Actress category. Not surprised to see Turner excluded. High didn’t make enough of a splash (or even a drip) in this season. I don’t think Redgrave’s performance was passionate enough to warrant a nomination here. It is nice to see Brief Encounter acknowledged. This is perhaps the category I feel most passionately about. There are some joys and outrages here. Norbert Leo Butz, while absolutely deserving of a nomination, should be placed in the Featured Actor category. His role as Carl Hanratty, the pursuer of Frank Abignale Jr. in Catch Me, is a supporting role, the latter (played by Aaron Tveit) being the lead. Butz and Tveit are both billed above the title, thus they are both automatically eligible for the Leading Actor category. For Tveit, competing against Butz would make his fight for a nomination that much more difficult. The Catch Me team could have appealed to the Tony Committee for Butz to be considered in the Featured Actor category, thus heightening Tveit’s chances for a nomination. What likely happened here was the Catch Me team did not feel confident that Tveit would receive a nomination, so rather than have no Best Leading Actor nomination for the show, they sacrificed their wild card for the sure thing. 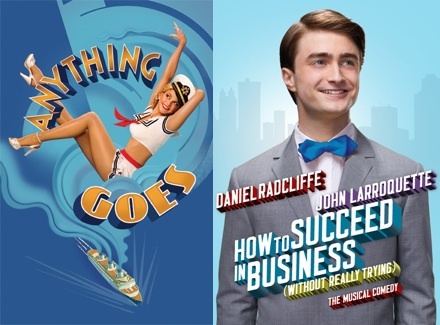 Most people will recognize and be shocked that Daniel Radcliffe was snubbed here for How To Succeed, but his performance, while good, was not polished enough. For ratings sake, however, he will still have to perform at the Tony Awards ceremony, as How To Succeed is nominated for Best Revival. Tony Sheldon is absolutely deserving of a nomination (although I predicted him for Featured Actor, and still stick by that claim). The joyous surprise here is Joshua Henry’s nomination for Scottsboro Boys. His was a fierce and heartbreaking performance, and his raw performance of “Nothin’” is still seared into my memory. Unfortunately, Benjamin Walker was not recognized for his completely take-charge performance in the title role in Bloody Bloody Andrew Jackson. My prediction is only incorrect here because the Tony Committee ruled that since there were only seven eligable performances in this category, as per the guidelines, only four would be nominated. This is, by far, the dullest category this year. Yeesh, I didn’t do so well in this category. Brad Fleischer was edged out by his cast mate with a better-written role, Arian Moayed, in Bengal Tiger. While Jerusalem and Motherf**ker slipped some nominees in here, I’m surprised more of Normal Heart’s stellar performances didn’t take up the spots. And of course, my extreme hope that Evan Jonigkeit would get a nomination for his performance in High did not come to fruition. Ouch, my worst category. I was really stretching here. It’s nice to see Judith Light and Lombardi recognized, although I believe hers was a leading role. Most of my incorrect guesses were due to my disagreement with the Tony Committee’s eligibility rulings, but how overjoyed I am that Colman Domingo is on this list! One of my favorite actors who I have championed since Passing Strange, I never thought I could hope for a nomination for this performance. It was bizarre, disturbing, and grotesque (in a word—perfect), but I thought for sure it would be overlooked due to Scottsboro’s premature closing. Equally as justified as Domingo’s nomination is his unnerving counterpart Forrest McClendon. Why isn’t Kerry Butler on this list? A gorgeous performance in a sinfully small role would have been a pleasure to see nominated, but LuPone was a wrench in this plan that I failed to see coming. I believe LuPone’s nomination is more out of respect and gawking fascination. Her role, while fun, wasn’t dense enough to warrant a nomination. In the case of Jerusalem’s exclusion, I don’t know how you can nominate two performances and a show for Best Play and not nominate its director. I should have seen this coming—Kathleen Marshall is too respected not to get a nomination for Anything Goes. Catch Me might have a lot of flaws, but that show focused heavily on its choreography, which should have been nominated. Thrilled that Bloody is honored here—much deserved. I’m surprised Sister Act made the cut, due to the cracks reported in the script, instead of Women on the Verge, which seemed to be more sophisticated (if far from perfect as well). This seems to be a situation of switching out one troubled book for another. While this was a tight category and all nominees are worthy, Born Yesterday belonged in this group. It’s not often that a set receives applause when the curtain rises. Thrilled that Bloody made the cut. Despite my love for Scottsboro, that minimal set (while wonderful, because I love minimal) still doesn’t seem worthy of a nomination. Those chair makers should be very happy for their Tony nomination! Switching out Bloody for How To Succeed is an outrage. True, in my review I raved about Catherine Zuber’s striking 1960s costumes; however, they were still predictable. Emily Rebholz’s costumes defined the tone of Bloody and brilliantly mixed eras and styles that had never before been seen together. For shame. Anything Goes and How To Succeed are dim compared to the bold and daring lighting of Bloody and Priscilla. How can Bloody’s bathing of the Bernard Jacobs Theatre in red be denied, or that LED bus in Priscilla? Lesson to be learned: Any show with guns gets in. An exciting awards season with lots of surprises and snubs! The nominations were spread out, even touching shows from the fall that seem far out of memory now. I thought Born Yesterday would make a bigger impact. I clearly underestimated Sister Act and overestimated voters’ faith in Bloody Bloody Andrew Jackson. Yet it seems that all remembrance energy went to Scottsboro Boys, which is a fair move. I am disappointed with the musical acting categories, as many supporting roles were considered leads, pushing out potential nominees like Aaron Tveit. (Um, why is Kerry Butler not nominated?) And for my departing thought, all I have to say is: COLMAN DOMINGO!! What do you think of the Tony Award nominations, Rushers? Have the announcements left you surprised, thrilled, or upset? What surprised you the most? Who do you think got robbed? Leave your Tony hysteria in the comments below, and let the race to the June 12 ceremony begin! I am also very unhappy that Daniel Radcliffe didn’t get a nomination… and agree with you about the Best Actor vs Featured Actor debacle. But, what are ya gonna do? I’m also very surprised about Sister Act… but I do love the movie (don’t judge, please) so I think I may go to see it now. Either way, I’ll be tuning in on June 12th to watch Daniel dance. And on June 13th to read Stage Rush’s take on who won! Thanks, Irina! I know people don’t go really nuts over the technical categories, but I’m glad you and I are in agreement. PRISCILLA and BBAJ not being nominated for lighting is crazypants. And don’t worry—I don’t just AND I loved the SISTER ACT movie! Watched it countless times on weekend mornings growing up. I’m responding to the comments you left on my blog here. =) I’m glad that we mostly agree, which is funny, because we don’t agree on a lot of shows this year. I totally agree that Norbert Leo Butz should be featured. I don’t really understand some of the featured/lead decisions. I forgot to mention this in my post, but I was thinking, “What set?” for that Scottsboro nomination. I laughed out loud when reading, “Those chair makers should be very happy for their Tony nomination!” COLMAN DOMINGO! Linda—hahahaha! I’m so glad you agree with me about the SCOTTSBORO set and enjoyed my chair joke. I can just see you sitting at your computer saying, “What set? !” Hahaha! Catch Me didn’t receive a nom for best choreography. I’m sad Daniel didn’t get a nomination for Lead Actor but given how cutthroat that category was…I guess I shouldn’t be surprised. Elisa, thank you! That was my mistake; it is corrected now. I probably made that mistake because I am now shocked that CATCH ME didn’t receive a nom for Best Choreography. That is silly. I’m overjoyed for Forrest McClendon, Colman Domingo and Joshua Henry. I was sitting front row center for The Scottsboro Boys (yes, behind the conductor!) and it was so thought-provoking, inventive and compelling. I’m also sorry about Nick Adams. I thought he was terrific in Priscilla. And of course I’m most disappointed about Daniel Radcliffe being snubbed. So much charm, great dancer, flawless American accent. I had a grin on my face from beginning to end. Esther, we should throw a party for the three SCOTTSBORO actors, cause I too am so excited about it! Especially since it was such an ensemble effort, too. Yes, I am disappointed about Nick Adams. I actually thought the race was wide open for him, at least for a nomination, because of Tony Sheldon being eligible for Lead Actor. But then the two SCOTTSBORO nominees swooped in, and I have to say, they deserve it over Adams. wow, what a spectacular year for plays and a meh year for musicals. i was overjoyed for colman (also been preaching his genius since seeing passing strange 5 times) and the scottsboro people. while i loved the hell out of book of mormon, scottsboro was my favorite musical this year. being as it closed WAY too soon, i thought it would be forgotten. a big bravo to them for nominating the hell out of normal heart, which i just saw sunday and was immensely blown away by. barkin deserves to win for the insane intensity she delivers that monologue. it was one of the only times in my life i have seen a show-stopping moment in a play. the actyors had to hold for 3 swells of applause and people shouting bravo. Best Leading Actor in a Musical…I’m also torn! There were simply too many outstanding male leads this year. I’m not that upset about Daniel Radcliffe, he was at the bottom of my list. But Benjamin Walker deserved and needed this nom – he believed in his role and the show so much that he stayed on board to bring it to Broadway, and he was phenomenal. Unlike a lot of reviewers (and tweeters) I loved Catch Me If You Can, and thought Aaron and Norbert were an amazing team, but yes, the show should have pushed more for NLB to be up for featured actor and put more faith in Aaron to grab the leading actor. Maybe I’m still bitter about the Next to Normal snub, but I wonder how many more originated roles it will take to see Tveit’s talent recognized. He doesn’t have to win the Tony just yet, just a nomination! Maybe he needs a really challenging performance that is unlike any pretty boy role he’s ever played. I’d be even more upset if I wasn’t so excited for Joshua, Colman, and Forrest! Did you SEE Audra’s excitement at announcing their names?! We should totally throw them a party! it was the kind of weighted, brilliant piece of theater I look for every year that will just stay with you forever. Melissa, Best Actor—Musical is going to be such a tight race, isn’t it? I know, Ben Walker really committed to that show, and became its heart, actually. He even turned down X-Men: First Class to be with BBAJ. But this show got him cast in Abraham Lincoln: Vampire Hunter, so that’s something. I also love CATCH ME. It has a lot of flaws, but that cast is so great and Kerry Butler broke my heart with “Fly, Fly Away.” I really hope Aaron Tveit gets his Tony time. Let’s not feel *too* bad for him. He IS starring in this show and becoming a superstar—no Tony nom (or lack thereof) is going to change that. VERY good point about a non-pretty-boy role. And finally, regarding SCOTTSBORO, I’m so happy for the three acting noms. Shocked that for such an ensemble piece, they were able to single out those three. But so deserved. Aaron Tveit was snubbed for a Tony nomination yet again. I agree with a majority of the nominations, but I mean, Kerry Butler and Aaron Tveit’s lack of nominations are kind of disappointing.